They cost about the same amount that you’d pay at a taqueria on 24th St. And they’re also comparable in monstrosity. Menos puntos: they’re very very stingy about the chips!! Which I was very disappointed about. A side order of tortilla chips was 3 euros (= $3.68). Which is a heck of a lot more expensive than their usual price of…free. Die Amerikanerin has the scoop! Guten Tag! 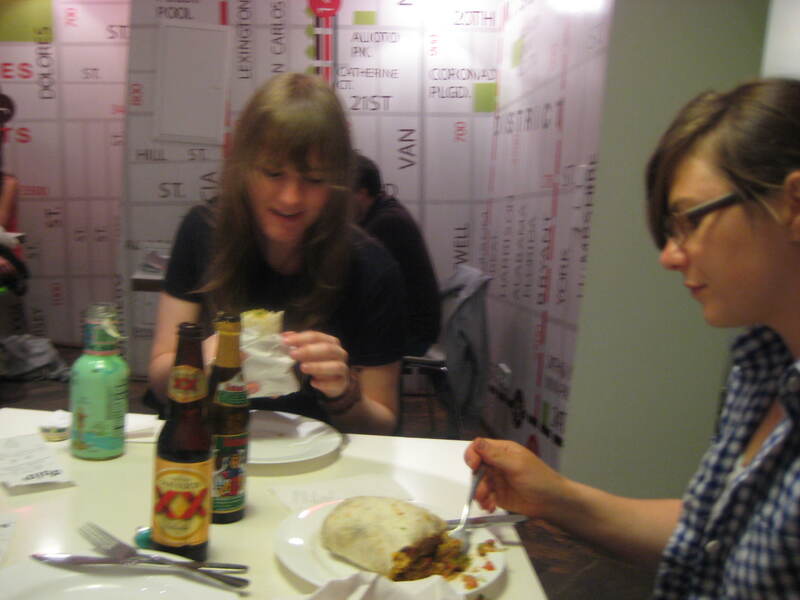 Mission Burritos in Berlin! I was there last summer, right around this time. Just like Lisa says, “I guess it would be similar to eating at one of those burrito chains they have in the suburbs, where they might have all the right ingredients, but somehow when combined they don’t hold up to a true Mission burrito.” Exactly on the money. The best part about this place is in the map on the wall. Makes you long for Muni and the park. Donde/wo esta/ist el/die foil? One does not trifle with the structural integrity of a burrito. The former Axis powers are certainly interested in our burrito technology. Farolito charges 50cents for chips now, such a lame move. not the real deal. German style Mexican food. OK for German people whp never has the genuine thing. Hay, if people like it, go for it but this is not real Mexican food. A good indicator is the flavorless salsa that was made of of almost all cubed tomatoes. Ever hear of Cilantro? OK I suppose but don’t purport your food to be the REAL DEAL, it’s a far cry from La Cumbre.